Firstly I start by saying I&apos;ve been on 27 cruises and there are good and bad points on every cruise. 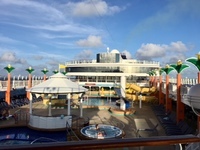 I’ve cruised with P&O, Princess, Celebrity, Royal Caribbean and Carnival Australia. This is my opinion only, everyone has differing tastes. 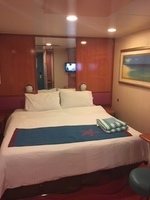 An experience for a first time cruiser will generally be different to that of an experienced cruiser. 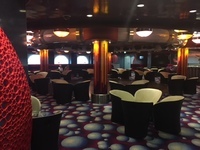 I chose this cruise as I wanted to try NCL. 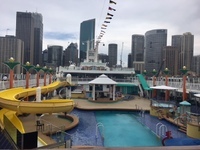 The people on board this cruise consisted of only 230 Aussies (surprising for a cruise out of Australia), 430 Germans, UK, Canadians and USA, Asians. There were very few children on board. 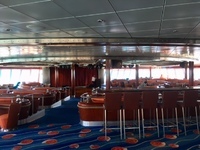 Embarkation: Terrible, probably the worst I’ve experienced. We were queued and standing for several hours. I really felt for the elderly passengers. The hold-up/bottleneck appeared to be in the Customs area (there were only 4 officials processing when I went through). Cabin The Good: good size bathroom and shower. The shower had a sliding door not a curtain; however you needed to sit sideways on the toilet. They have little swimming fish printed on the carpet in the hallways showing the direction to the bow. My room was located above the theatre but I wasn’t interrupted by noise. The Bad: very small, poorly designed room, very tight to get round the bed and I kept hitting my head on the bunk bed (which was raised) and the light fittings in the bed head. No room steward name in the room and when I introduced myself on the second day of the cruise she never gave me her name and never greeted me by name, also general poor attention to detail in room. Very few TV channels other than cruise line advertising. 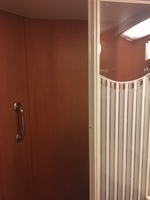 There were too many loud entertainment announcements outside the cabin and in public areas (disruptive), cabin walls are very thin and you can easily hear neighbours, mattresses need replacing - they’re old and lumpy. Entertainment The Good: Entertainment was better than average, Burn the floor was excellent, as was Cirque Bijou, the physical comedian and the acrobats were great. 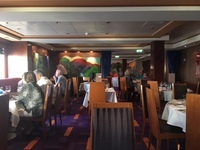 Good Australian cruise director: David Food The Good: good variety in main dining room menu and service in the main dining rooms was excellent. Flexible dining and dress options are good however as I was traveling solo if I wished to share a table for dinner it was usually a table for 4 so I ended up sitting next to a couple, good glassware in main restaurants The Bad: average, lukewarm food - the food in the main dining room had been prepared well in advance and tasted like it had been sitting around for quite a while (often lukewarm and stale bread with dinner). The Garden Cafe is like a cafeteria and the quality of the food is poor with cheap artificially flavoured ingredients. 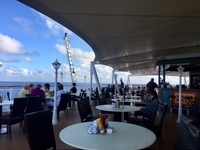 In the outdoor areas, drinks are served in disposable plastic cups. They ran out of many items; my wine on day 2, fresh fruit was limited (they ran out of water melon on arrival to New Zealand) they have a mojito bar and ran out of mint! they ran out of fresh milk and had milk in little UHT containers. 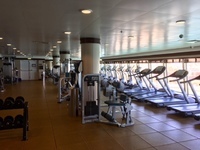 I actually lost weight on this Cruise General The Good: great wide decks, good lifts and onboard communication screens. Port arrivals and disembarkation were well organised. 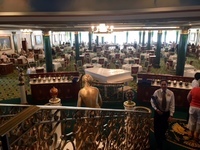 Most of the staff were friendly and offered good service The Bad: very dated décor, low ceilings and very dark throughout the ship especially in the restaurants. General cleaning and removal of rubbish around the vessel was not up to standard. Empty cigarette packs and dirty glasses were noticed in some areas for 3 days before they were cleaned away. Room service dirty dishes left in hallways for many hours. Drinks were very expensive as an 18% gratuity is added to each purchase and then USA to Australian conversion. A very expensive $39 US for airport shuttle (double the price of Australian cruises), Shore excursions were also very overpriced. Smoking is allowed in Casino. 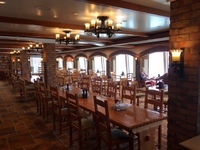 Staff often talked amongst themselves in their own languages in front of guests. Firstly I start by saying I&apos;ve been on 27 cruises and there are good and bad points on every cruise. 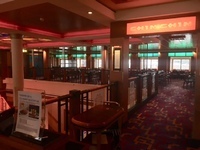 I’ve cruised with P&O, Princess, Celebrity, Royal Caribbean and Carnival Australia. This is my opinion only, everyone has differing tastes. 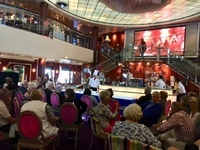 An experience for a first time cruiser will generally be different to that of an experienced cruiser. 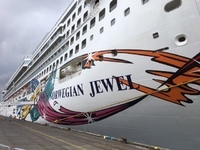 I chose this cruise as I wanted to try NCL. 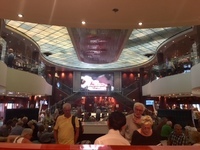 The people on board this cruise consisted of only 230 Aussies (surprising for a cruise out of Australia), 430 Germans, UK, Canadians and USA, Asians. There were very few children on board. 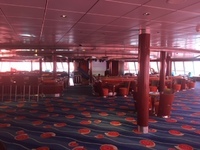 Embarkation: Terrible, probably the worst I’ve experienced. We were queued and standing for several hours. I really felt for the elderly passengers. The hold-up/bottleneck appeared to be in the Customs area (there were only 4 officials processing when I went through). The Good: good size bathroom and shower. 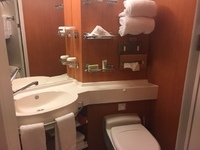 The shower had a sliding door not a curtain; however you needed to sit sideways on the toilet. 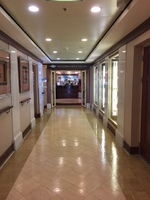 They have little swimming fish printed on the carpet in the hallways showing the direction to the bow. 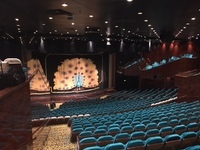 My room was located above the theatre but I wasn’t interrupted by noise. The Bad: very small, poorly designed room, very tight to get round the bed and I kept hitting my head on the bunk bed (which was raised) and the light fittings in the bed head. No room steward name in the room and when I introduced myself on the second day of the cruise she never gave me her name and never greeted me by name, also general poor attention to detail in room. Very few TV channels other than cruise line advertising. 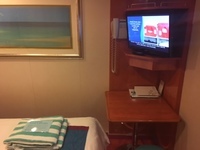 There were too many loud entertainment announcements outside the cabin and in public areas (disruptive), cabin walls are very thin and you can easily hear neighbours, mattresses need replacing - they’re old and lumpy. 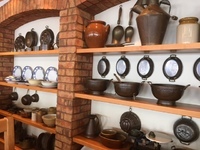 The Bad: average, lukewarm food - the food in the main dining room had been prepared well in advance and tasted like it had been sitting around for quite a while (often lukewarm and stale bread with dinner). The Garden Cafe is like a cafeteria and the quality of the food is poor with cheap artificially flavoured ingredients. 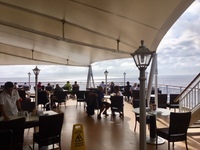 In the outdoor areas, drinks are served in disposable plastic cups. 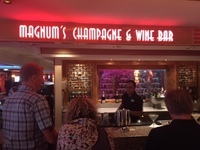 They ran out of many items; my wine on day 2, fresh fruit was limited (they ran out of water melon on arrival to New Zealand) they have a mojito bar and ran out of mint! they ran out of fresh milk and had milk in little UHT containers. 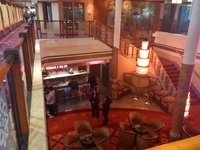 The Bad: very dated décor, low ceilings and very dark throughout the ship especially in the restaurants. General cleaning and removal of rubbish around the vessel was not up to standard. Empty cigarette packs and dirty glasses were noticed in some areas for 3 days before they were cleaned away. Room service dirty dishes left in hallways for many hours. Drinks were very expensive as an 18% gratuity is added to each purchase and then USA to Australian conversion. A very expensive $39 US for airport shuttle (double the price of Australian cruises), Shore excursions were also very overpriced. Smoking is allowed in Casino. 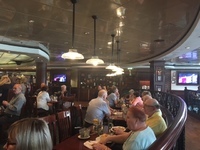 Staff often talked amongst themselves in their own languages in front of guests.